Among the myriad blends of masalas that I got for the Masala Day Spice Swap was a Malvani Sunday Masala sent by Shakti Salgaonkar. This fiery vermillion coloured mix smelled heavenly and I was eager to cook with it. 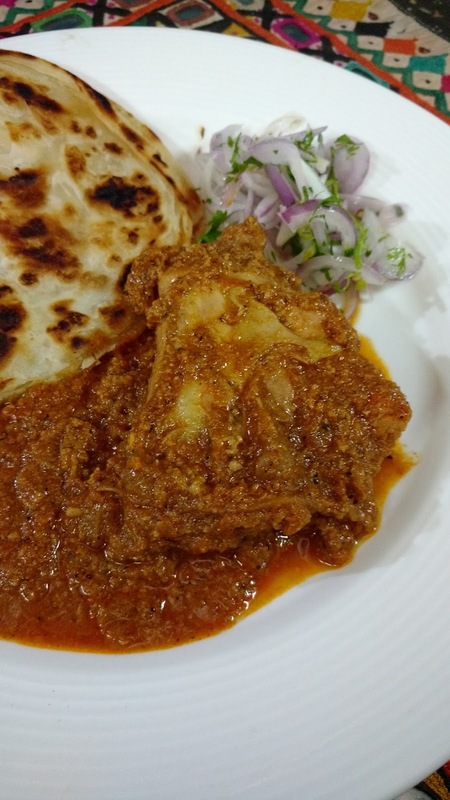 The weekend was on us and I decided to make a Sunday Malvani Chicken using the masala she'd sent. I followed the recipe Shakti shared and the only thing I tweaked was the quantity of onions (I used more). 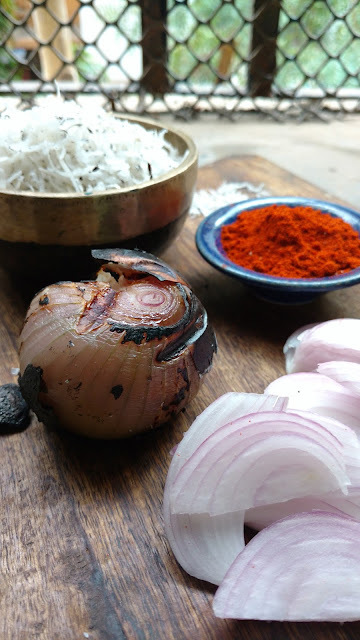 The recipe below is completely Shakti Salgaongar's and like I mentioned, just the quantity of onions is greater. I had heard of charred onions being used in recipes but had never done so myself. This was my first time and I was quite excited to learn a new technique. I have to say the results were worth all the effort. Marinate the chicken in the marinade ingredients for an hour or longer. Make slashes in the fleshy parts of the meat so the marinade goes in nicely. Grind the charred onions to a paste. Heat ghee in your cooking vessel and fry the sliced onions till they turn brown. Don't burn the onions. I like to add half a teaspoon of sugar for a richer brown and deeper flavour. Set aside a couple of tablespoons of fried onions for the Vaatan. To make the vaatan grate the dried coconut and toast on a tava till you get a nice aroma. Cool slightly and then grind to a paste with the reserved fried onions. In the wok with the fried onions add the Malvani masala powder and the charred onion paste. Fry slowly till the masala is cooked and has no raw smell. Add the marinated chicken legs and cook further till the masala is nicely coated on the chicken and the meat has turned opaque. Add water and cook till the chicken is half done. Now add the vaatan and mix it all well. Adjust salt and then cook covered till the chicken is cooked through. Remove to a serving dish, garnish with fresh coriander and serve with rotis or parathas or even with rice if you like. A simple kachumbar of sliced onions, minced coriander and lemon juice also goes really well with the Sunday Malvani Chicken and parathas.